Why knowing and participating in God’s mission is the way to make sense of this life, and find real satisfaction and fulfilment. It is not that uncommon to respond “…but, He has a purpose,” when we are challenged to give an explanation to difficult situations in this life. And difficult situations in this life are a dime a dozen, unfortunately. It gives very little real comfort to the ones suffering. Now, it may be well intended and the fact is that He is, actually, in absolute control of everything that is happening, having a purpose for each and all events in our life. But answering this way may be perceived as a escape gate, a way for us Christians to present an answer that seems solid and authoritative, but it is really our way to say we have no clue of what is going on. Not knowing what is going on is not the problem. After all, we are limited humans. The bigger question here is what does God has to say about the difficult issues of life. Is it possible to find a satisfactory answer in Scripture, an answer that – at the same time – honors God and gives us the comfort, assurance, and peace we need? 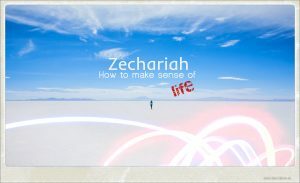 Another way to put it is this: Can the Bible tells us how to make sense of life, here and now, with some level of detail? At an early age, one of my brothers presented me with one of the first ideas about God that I remember considering seriously. God, he told me, was like this great and awesome clockmaker. He created all the pieces of this reality, and put them together. He proceeded to wind the mechanism to make everything work in perfect harmony. Then, after contemplating His creation, and being deeply satisfied, He left. He left His creation to fend for itself. This is a very interesting story and, as you can imagine, at that young age I found it to be a good explanation of how the world works. However, the story is totally inaccurate. He has never left. God is here. And His presence among us is more than just for companionship. He is not here just hanging out with us, because He does not have anything more interesting to do. He is here, and He is at work. He is here, and He is still working redemption for His people. Our God is on a mission. The good thing is that He is very public about that mission. He is acting, intentionally and personally involved in the affairs of men, and He is not silent about it. On the contrary, He has revealed Himself to us in ways we can understand. His revelation has nothing to do with how worthy we are, or how smart or evolved we have become. It has everything to do with His character, with how generous, compassionate, merciful, and just He really is. The God of the Universe is involved with His creation; He is here, He is at work, and He is not silent. Those, familia, are truths we need to celebrate. As He continues with His mission, our God calls and equips us to be part of that very mission. As we read Scripture, we learn about His work and about His call for us. Then, as we learn this story of redemption He is writing, the question for us is not how this story applies to us, but instead what part of the story He is calling us to be at. This clear revelation of His work of redemption, and His call to join Him, is what we need to make sense of life. Knowing that He is actively working in the redemption of His people demonstrates that there is nothing casual about this life. Every single moment matters for all eternity. Every single human interaction matters for all eternity. And we can categorize all these moments and interactions into two groups: joy & pain. He is not calling me to just accept, almost blindly, that He has a purpose. He is unpacking that purpose and telling me what part my life events play in His work of restoration, here and now. Making sense of life is more than having the right knowledge. It’s about responding correctly to life events, either pain or joy. It’s about being faithful in the part of His mission He is calling us to play. It is about experiencing meaningful spiritual transformation, to the point of finding satisfaction and fulfilment in this life, as we wait for that future Glory that is coming. Knowing that He is in a mission, that He is calling us to be part of it, and that pain and joy were ordained to produce in us one or a combination of those three end results does not make life easy. It gives us the right perspective. It give us a level of detail about why things happen, and about how we must proceed that we cannot enjoy otherwise. Then, satisfaction and fulfilment come not from our circumstances, but from getting to know Him better, knowing our heart better – to confess, repent, celebrate – and from being a blessing for others. All these things can take place only when we find ourselves participating in God’s mission. Knowing Missio Dei is the first step. When challenged by life to make sense of it, we should embarque in a journey of discovery by asking questions like: How does this situation help me to know Him better? What can I learn about myself – either about my own idols and sin, or about His work of restoration in me? How is He using this life event to equip me better to be a blessing to others? Empowered by God the Holy Spirit, using His Word for guidance, enjoying the support He provides through His Church and Sacraments, the answers to these questions can help us to make sense of this complicated life. What lies ahead are not tranquil waters, with room only for joyful events – our sin guarantees it will not be so. But He is good, and in His revelation He tells us that He is there, He is not silent, and that He is in a mission to which He is calling us to be part of. When joy and pain come by, do not forget this multi-faced truth. Let us remember His grace, constantly.